Yes, until he's moved to Broken Oar Grotto during Lights Out! 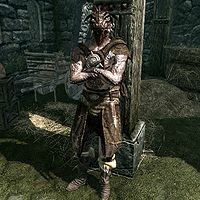 Jaree-Ra is an Argonian rogue residing in Angeline's Aromatics in Solitude. He and his sister Deeja work for Vittoria Vici at the East Empire Company, while his brother Gulum-Ei is a Thieves Guild fence. With his connections, he has established a racket with the Blackblood Marauders, committing all kinds of theft. He's looking for someone to help his gang rob a ship on its way to Solitude during Lights Out!. Until you have initiated the quest, Jaree-Ra will hang out in the business district, preferably between Angeline's Aromatics and the pathway leading to Castle Dour. When you have heard him out on his task, he will start his daily routine and join Deeja as a dockside worker between 10am and 6pm, when he returns to Angeline. He was supposed to sleep between 2am and 10am but doesn't, due to a bug. Jaree-Ra wields an iron dagger and wears hide armor with hide boots. His treasure hunts apparently provided much wealth, as he carries a selection of upper-class items and gold. 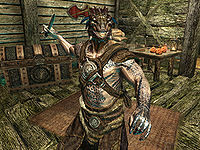 Jaree-Ra is a known name in Solitude, although the townsfolk have differing opinions on the Argonian and his 'jobs'. Before you've listened to Jaree-Ra's offer, when asking innkeeper Corpulus for rumors, he may divulge: "I've heard Jaree-Ra is hanging around the Wells District, looking for new blood to hire. "; which gives you a miscellaneous objective to seek out Jaree-Ra for possible employment. Fruitvendor Jala may too mention him at this point as one of the interesting people she sees: "Jaree-Ra stopped by the other day. Told me to keep an eye out for him, see if any new people arrived in the city." A few people dislike the Argonian with a passion. 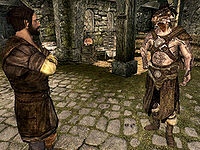 Inside the Solitude Blacksmith, Heimvar will mention Jaree-Ra when asked how much he earns: "If money's all you hold dear, then you you [sic] end up like Jaree-Ra. A plague on the city." When you ask about his problem with Jaree-Ra, he will continue: "Captain Aldis can't prove it, but that Argonian is up to no good." Local headsman Ahtar is even less impressed with Jaree-Ra and will, when asked when his next execution is due, admit: "Ain't got one. But I'd fancy a chance at that Jaree-Ra's scrawny neck. Filthy Argonian never would have set foot in this city, if High King Torygg was still alive. I can tell you that." Jaree-Ra: "My contact, she says Hammerfell steel is much desired by certain parties." 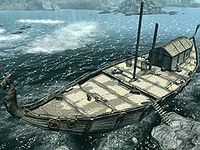 Gulum-Ei: "I know of a ship coming in from Hammerfell. Some cargo might get "lost"..."
Deeja: "Why should we settle for half a fin when we could just take the whole whale?" Sorex: "I'm not interested, Jaree. It doesn't matter how many times you ask." Jaree-Ra: "You might want to rethink that. You're missing out on some wonderful opportunities, working in that bar." Jaree-Ra hangs out around the shops, and will call out to you as you pass by: "I've got a little work if you're interested, traveler." and "You should see me when you get bored, stranger." When you approach him, he'll keep trying to catch your attention: "You look new. I'm new, too. I think we could be friends. ", "If you're looking for opportunities to make some coin, well... I'm your man. ", and "Everyone needs work, right? I have good work for you." When you greet him he will get straight to the point: "You're passing through Solitude? Maybe you're looking to make some easy gold, yes?" When you ask him what he has in mind, he'll explain what he does for a living: "It's easy to find things to sell. Things nobody will miss. Things from underground, or just left lying around in someone's house. I bet the two of us, we're very alike. So why not take the next step? We can help each other. My sister Deeja and I are treasure hunters. We like to collect things." If you end the conversation from this point on, he'll part with: "Just remember I'm here if you rethink your decision. "; in which case, asking him what he suggested before will have him repeat: "As I said, it's easy to find things nobody will miss. My sister Deeja and I are treasure hunters. You could be too." If you choose to tell him you're no thief, he'll rephrase by implying: "Of course not! Thieves take what is precious. Thieves steal. We just take what will not be missed. What no one needs anymore. Maybe we take some weapons and stop a few deaths. Who would call that thievery?" "We have an interest in one of those boats, the Icerunner." State that you're listening and he'll remark: "I knew you looked like a clever one..." Then ask him about his offer, and he'll explain: "With the war, many more ships come through these docks. Loaded with weapons and pay, but few people. And they pass through dangerous waters. We have an interest in one of those boats, the Icerunner. The Solitude Lighthouse will be guiding it in... but if its fire were to go out, the Icerunner would run aground." Asking him if he wants you to put out the lighthouse fire, he'll put up a cautious facade with: "What an interesting idea. I think if someone were to do something like that, there would definitely be a certain amount of loot to be shared... Yes, if someone were to put out the Lighthouse fire and then meet me on the docks afterwards... I could certainly direct them to that loot." If you threaten to turn him into the guards he will remain calm and point out: "Turn me in? For what? What crime's been committed? I'm just making idle talk about what would most undoubtedly be a tragic event... A tragic, and very, very profitable event." If you ask Jaree-Ra about the fate of the guards he will claim: "Don't worry about them. We'll make sure they wash up safe. Maybe they'll even pay us for the heroic rescue from their sad crash." He won't take no for an answer and the quest will begin. If you get near him during his daily routine he will remind you: "I believe you know what needs to be done. Something about putting out a fire?" "To Oblivion with your loot! This ends now!" Once you have shut down the light of Solitude Lighthouse, Jaree-Ra will wait for you on the stairs leading to the dockside, and greet you with: "Looks like you had no trouble." When you report that you have put out the fire, he'll reveal: "The effects have already been felt. The Icerunner has failed to dock on time. Without the Lighthouse, the Icerunner will have swung wide of the western shoal and run aground on the eastern coast. My sister Deeja will be at the wreck with our Blackblood Marauders. She knows to expect you." When approached again, he will tell you to press on: "Get moving. I'll see if I can't delay any patrols out there." You can then ask him if he is the leader of the Blackblood Marauders: "Deeja and I are more like their representatives here in Solitude. None of the Blackbloods can show themselves without being arrested." He will also explain why the marauders didn't put out the fire themselves should you ask: "The Blackblood Marauders are... very identifiable. I didn't want anyone thinking the Blackbloods were getting too bold." When you leave for the Icerunner, Jaree-Ra will stay on the dockside. As opposed to what Jaree-Ra claimed before, you'll find the ship's crew murdered by the thugs inhabiting the ship. When you meet Deeja below deck on the Wreck of the Icerunner, she'll quickly pull her weapon on you, forcing you to kill her. On her body is a note from Jaree-Ra asking Deeja to meet him inside Broken Oar Grotto, the current base of the Blackblood gang. At this point, Jaree-Ra will relocate to the woodworks in the back of the cave, along with numerous Blackblood Marauders and their leader Captain Hargar. There will be little talk, as they will all attack you on sight, with Jaree-Ra coming to their aid if necessary. If you manage to get close to Jaree-Ra without being detected, he may walk up to you: "First you murder my sister, then you massacre my men!" You can only reply with "...", after which he exclaims: "To Oblivion with your loot! This ends now! ", after which he'll attack. When Jaree-Ra is dead, the quest will finish and the treasure scattered around the cave will be yours to take. Now that Jaree-Ra is dead by your hand, you can inform Ahtar when he brings him up in conversation, to which he'll thank you for the deed: "Good man/lass." The related quest was supposed to have multiple outcomes, presumably with Deeja betraying Jaree-Ra. According to the game files, Jaree-Ra would say: "I've been away from Solitude for as long as I can. But if you decide to finish these bandits off, you'll be rewarded for your efforts." Also, after taking care of the bandits in question, you could have returned to Jaree-Ra and said: "Looks like Deeja won't be bothering us again", to which he would have responded: "Good riddance." Alternatively, you could have said: "Deeja will need to be locked up. ", and he would answer: "I'll take care of it." "You've betrayed me, murdered my sister and massacred my men!" "You don't have what it takes to kill me." Jaree-Ra was supposed to sleep in Angeline's Aromatics between 2am and 10am, but there are no free beds available. As a result, he will wander around the main trading room all night long. Jaree-Ra continues to utter his idle lines concerning him having work for you after already having heard his offer. This bug is fixed by version 1.3.2a of the Unofficial Skyrim Patch. Jaree-Ra may attack you on sight after you have liberated Hjaalmarch for the Stormcloaks, or after clearing Fort Hraggstad for the Imperials. Since he is an essential character at this point you can not kill him. Thus your only options are either flee from him or avoid being detected by him. After Solitude has been conquered and thus the civil war has ended, he will revert back to his normal behavior. This page was last modified on 18 October 2018, at 02:57.